Honorable MUNRFE members! 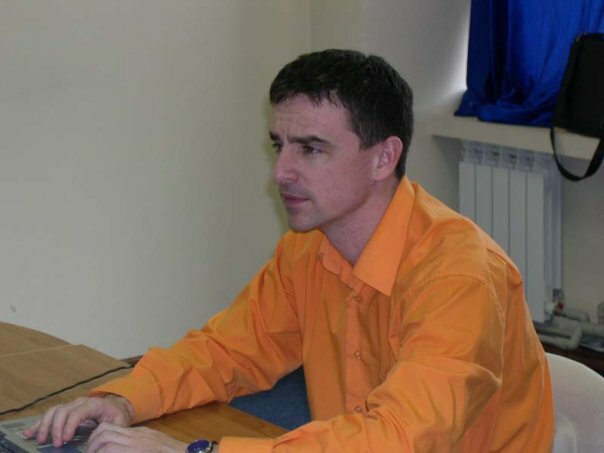 It is our pleasure to announce that today, on the 9th of September, 2011, elections of the President of Blagoveshchnesk MUNRFE Club were conducted. And MUNRFE shall welcome Liliya Yakubova, who has successfully won the elections. Ms. Yakubova, please, take our sincere congratulations with your new office. Liliya, who's path in MUNRFE began in 2008, is one of the most experienced members not only in Blagoveshchensk Club, but in the entire Organization also. She has shown her devotion to MUNRFE via her participation in numerous MUN Conferences, FireStarters, Master-Classes and other MUNRFE projects. We wish you good luck with your new responsibilities. We believe you will perform your job in the best way possible and together we will lead MUNRFE to the brightest future! One more time, please, accept our warmest congratulations! 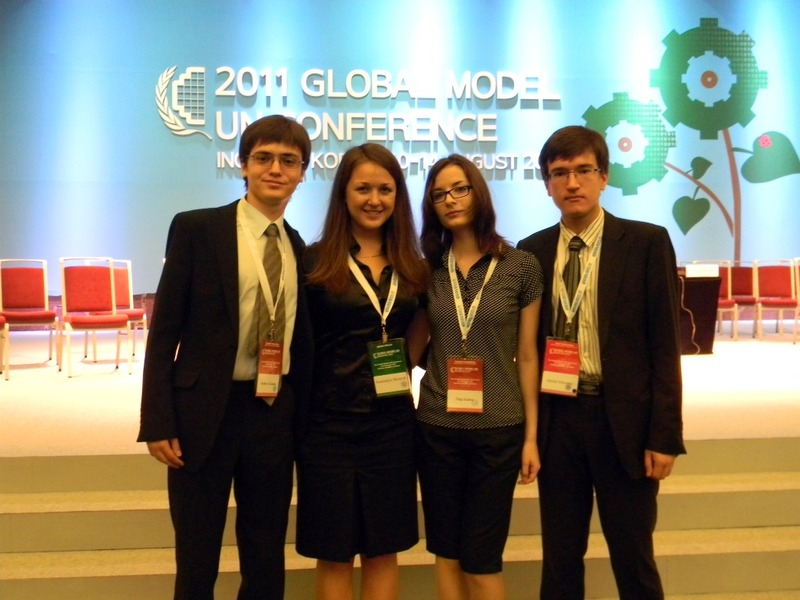 Global Model United Nations 2011 successfully ended! 3rd Annual Global Model UN is over. It is not just yet another MUN Conference. Global MUN is more than 600 delegates from 65 all over the world representing different MUN associations. 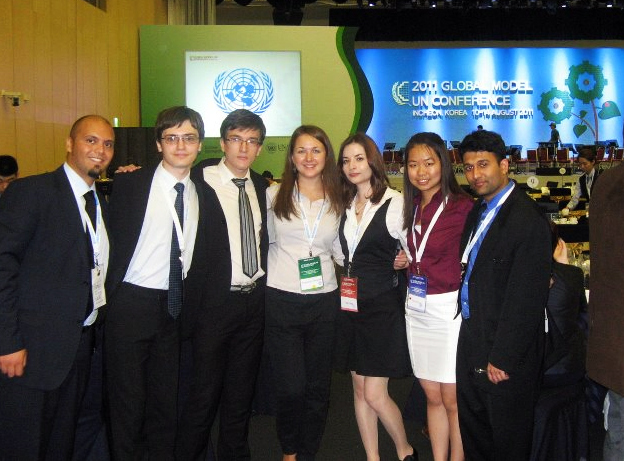 Global MUN is the Conference with the most realistic procedural rules, almost the same with real procedural rules of the United Nations General Assembly, presence of the UN Secretary-General Ban Ki-Moon and other high-ranked UN officials, adopted resolutions drafted to the UN Headquarters in New York and another step forward for MUNRFE. Global Model United Nations 2011 has started! It is our great pleasure to share with you the information from the Republic of Korea: the 3rd Global Model United Nations Conference in the Korean city Inchon has started! The honor of MUNRFE is represented there by Olga Katina, Alexey Sidorenko, Andrey Kozinets and Anastasia Skripnick. We would like to mention especially that Anastasia Skripnick is the member of Secretariat during such a big and important youth related international event. More than 600 delegates from all over the world will have debates in frames 4 committees of the UN General Assembly: 1st Committee – international security and disarmament, 2nd Committee – economic and financial issues, 3rd Committee – Social, Humanitarian and Cultural affairs and 4th Committee – special political and decolonization issues. The XIX MUNRFE Pres. Council took place in Vladivostok, 1-3 of July. For the first time for the last 2 years the Council was held in 3 instead of 2 days which gave all the participants more time in order to discuss all the issues in detailed properties. For the first time in a while MUNRFE Founder Jeffrey Lindstrom took part in Pres. Council and contributed a lot to the productivness of the Council through asking catchy questions and making wise remarks and comments. Also for the first time the incorporator of Non-Ptofit Making Partnership “MUNRFE” T.A. 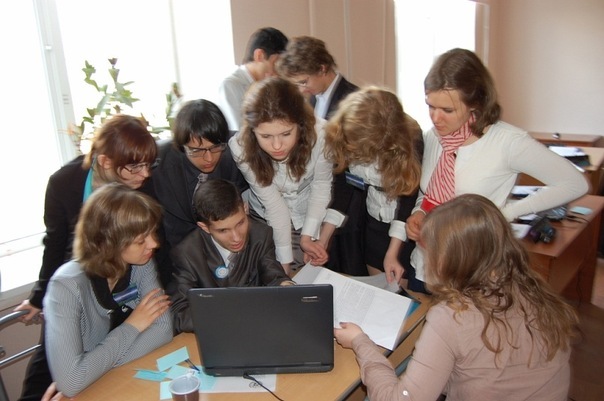 Gubaidulina took part in such important project for Model United Nations of the Russian Far East. Sometimes we experience a trouble, but its consequences are much harder than it was expected. Or, on the contrary, we reach something, and it brings us more than we supposed it to be. It is like an iceberg: you see only a smaller part of it being far from it, but its real size can be realized only while colliding with it. Icebergs are sometimes nice, though. Marina Rashchepkina, member of VladMUNRFE, faced her iceberg after getting a scholarship of Vladimir Potanin as a result of 2-day contest, including an intelligence test and a set of tasks aimed at showing of participants’ leadership skills, team work, public speaking etc. A won scholarship was not the end, as she was also granted an opportunity to take part in Potanin Summer School, June, 27 – July, 1, 2011, in the park-hotel “Olympian”, Moscow area. After all the preparations, sending tens of invitations, hard negotiations and brainstorming, the most significant event of this summer happened! On the 28th of June MUNRFE Alumni Reunion took place and gathered more than twenty participants! 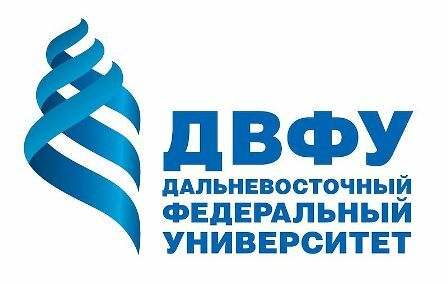 The decision to conduct the Reunion in Vladivostok was made at XVIII President Council and fully proved its value. Vladivostok club welcomed its distinguished guests warmly and hospitably in a cozy restaurant with nice Asian atmosphere. But it was not the greatest delight of that evening. The guests, of course, were the most important part of this event and constitute what MUNRFE definitely can be proud of. Names of Roman Kopko, Ekaterina Baranova, Sergey Koval, Evgeney Bugrov, Ekaterina Kramarenko you do not hear very often now, but these people are those who were creating the history of the Organization and once devoted their student years to MUN like we continue doing it now. The most outstanding guest there was the Founder himself. 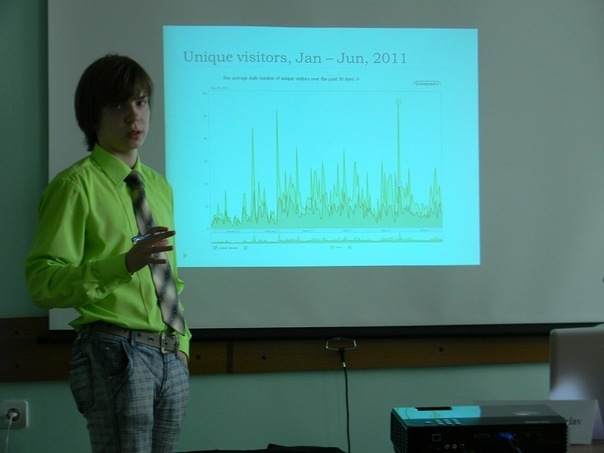 We are happy to announce that the II Regional MUNRFE Session was successfully held in the city of Khabarovsk on 7th- 10th of May, 2011. The Conference gathered more than 30 delegates from all three MUNRFE Clubs under the leadership of really knowledgeable and professional Secretariat. We have simulated 3 Committees with one MUNRFE traditional – the UN Security Council, and two revitalized bodies – the Second Committee of the UN General Assembly and the International Atomic Energy Agency Board of Governors. Moreover, one more UN entity was organized – the UN Department of Public Information headed by the Under-Secretary-General for Communications and Public Information. The process of self-development in MUNRFE can be compared with constant movement up on the ladder when your persistence and hard-working every time give you an opportunity to walk up on a new level. And I saw the preparation for the IX IC, then the preparation for the SF and NY conferences as steps on my own way of self-development. But just before my trip to SF I faced the fact that I had never saw the conference itself on my ladder – thus it meant that I had lost the sufficient direction for my movement. Fortunately, that is not the end of the story. While presenting my first speech in front of the huge committee, I have understood what kind of step is in front of me. This step is a great challenge of your personality. To tell the truth it is quite easy to become a strong leader in a committee where are 10 or 15 people and when you are well prepared. But it is enormously difficult to become really bright delegate when there are about 100 people with 90% to be native speakers. And it helps you to see whether you are really strong personality who can make speak about him any amount of people – or you still have to do a long way up on the ladder of your self-development. But the only thing I can say for sure is that this unique opportunity to challenge yourself is worth of sleepless nights full of research for the conference and polishing up of your documents. Because once you have managed to overcome this challenge you will automatically find yourself on enormously high level full of confidence that only laziness and imaginations are the limits of your growth. 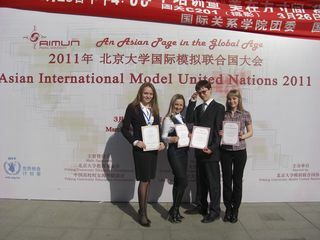 We are glad to inform you that team of 4 delegates (Marina Raschepkina, Kseniya Sukhotina, Andrey Kozinets and Catherine Vognerubova) and Daria Bulatova as an advisor sucessfully took part in the Aisian International Model United Nations (AIMUN), which was held in the city of Beijing, 23-27th of March. This Conference is the biggest one in mainland China. This year it gathered 539 from 100 universities from such countries as China, Singapore, Pakistan, Shri-Lanka, Ghana, Senegal, Nigeria, Germany, United States and Great Britain.